When I first started hearing folks talking about complexity and social change 10-15 years ago, I figured that was fine for the ecologists and physicists, but not much use to me. Yet the more I heard, the more the ideas started making intuitive sense to me. When you’re working for social change, you’re mucking with complex adaptive systems, and our old time straightforward, linear management tools (such as logframes) just don’t cut it. 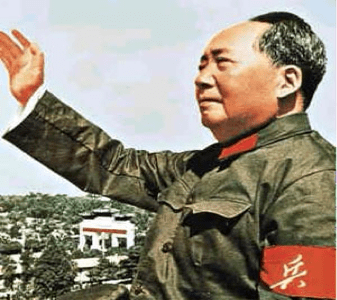 I’ve written before about complexity and managing social change (check it out if you want to see Mao compared to a spider’s web). And if you’re like me, you find it’s easier to talk about complex adaptive systems than it is manage them. So it’s very helpful to know that there are lots of tools out there for practical approaches to planning for, managing, and evaluating complexity. Today’s blog is about a few of the cool tools that are “complexity aware,” and helpful in making us more successful where the right path forward is not clear from the beginning. These tools flip the logic of traditional management approaches. Instead of anticipating what might happen and laying out a plan to deal with it, many of these tools jump to what happened, or might happen, and track back to what you did that might have contributed to it. That’s right, contributed, not caused. It’s actually liberating to give up claims that you and your colleagues are responsible for some key policy change, cultural shift, or rebalance of power. That’s just not how social change happens. These tools liberate you to look at what forces are pushing in different directions – cultural, political, technological, economic, whatever it is you suspect matters – and gauge the contribution of each to the results you want to see. So below are some of my favorites, though there are many more. Feel free to point to others in the comments below. One tool that is especially useful for monitoring and evaluation is Outcome Harvesting (developed by Ricardo Wilson-Grau and his colleagues), and the closely related Outcome Mapping (developed by the International Development Research Centre in Canada). These two methods don’t try to predict social reality in any great detail, or at least don’t assume that what you want to happen will. While logical frameworks are good for disciplining our thinking, change in complex situations often produces unexpected results which can be hard to capture with logframes. These outcomes take place in a context of many players, social forces, global and local trends. The Outcome Harvesting method can help get at outputs and outcomes that were unanticipated or came about in unexpected ways. This method is well suited to complex adaptive systems, where there are indirect relationships between program inputs and outcomes. The method is also valuable in that it integrates stakeholders in the process of learning what’s going on, rather than some external facilitator. While there are many steps in the process, for me the essence is giving people a structured way of thinking about outcomes, whether intended or not. For collecting observations from participants, a simple form such as the following can guide participants to watch out for outcomes, whether expected or not. If your goal requires you to work with stacks of moving parts – reducing homelessness, defending territory from extractive industry, overcoming achievement gaps in education – it can be helpful to create a map showing what forces are pushing in what directions. These maps can give you a picture of what’s going on, and suggest paths to influence that are most likely to succeed. Systems mapping is not including everything, it’s knowing what to exclude. 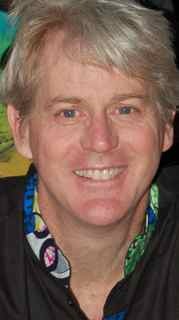 And as Bob Williams is fond of pointing out, what you include and what you leave out are always ethical decisions: who gets to be part of the system and whose perspective is taken into account. Now the important thing here is not the product – in fact these maps are pretty eye-crossing, to tell the truth. The real value is in the process of getting a group together to discuss the issues and hear each other’s perspectives on what’s in and what’s out, and what the relationships among the elements should be. These maps can help then figure out how you’re going to work together, and what avenues are most likely to be productive, and which are just a bridge to far at this point. An additional tool that can be very useful for planning is to map out the main players in their system. In this way, participants can generate a clear consensus about who is important to the system, who has influence and who does not, and which players the agency can most likely influence. The map below is an example: it represents the world of funding of issues important to Indigenous Peoples. This map was created by participants, and clarified who played what roles, who was within two degrees of separation of participants, and what kind of relationships participants wanted with the various players over the next five years. Note that I am not talking Social Network Analysis here, a related but quite different tool. 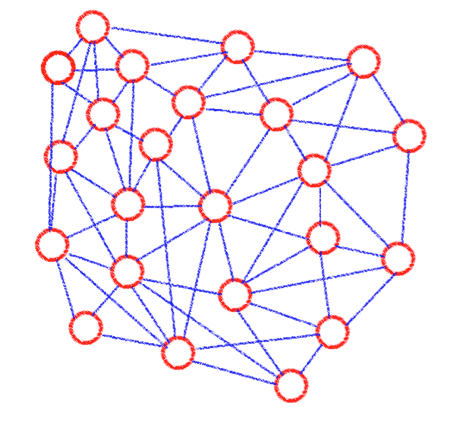 Social Network Analysis (SNA) tends to use questionnaires to generate a social matrix, that then creates a map with specialized software. While SNA maps have a certain “wow” factor, I find that participants have a harder time interpreting them, since the machine-generated maps can mask mistakes or biases in the underlying data, and lead participants to false conclusions about who is in relationship with whom and how. They are also harder for participants to manipulate themselves as they update their understanding of relationships and lines of influence. The method I prefer instead asks participants to generate their own maps based on their own experience and perspective. They reflect their lived experience, and can build in far more nuance. Debates over the maps generate consensus among participants, which is important for developing a Theory of Change. The more perspectives the process includes, the more valuable the maps are. So this is just a sampling of the many tools being developed and used to take complexity seriously. Let me know which you’ve found useful, and how you’ve used them. It’s no secret it’s getting harder and harder for civil society organizations around the world to function, and for funders to support them. There are lessons for us from the field of social resilience, which talks about how to keep things going in the face of shocks and stresses. The field made major strides in recent years in understanding how to manage shifting environments, and we can use them here. We’ve just published an article by the Global Greengrants Fund, supported by the Global Fund for Community Foundations, on what funders around the world are doing to handle the ever-shifting sands of supporting civil society. You can read the blog here, and the full article here. Comments are always welcome as we figure out ways forward in these troubling times. It’s hard to think of a sector with less accountability built in than philanthropy. So it’s up to us in the field itself to make sure that grantmakers are open and responsive to the folks we’re trying to help. I’ve just come from the annual EDGE Funders Alliance meeting, which devoted huge amounts of time to figuring out how to democratize grantmaking. To me these conversations respond not only from the ethical principle of breaking down the barriers of privilege, but also from the practical idea that our action is more effective when we’re working together toward common goals. Funders, grantees, support organizations, everyone. For too long now it’s been OK for grantmakers to set ourselves apart from the movements we fund, holding ourselves above the fray. It’s no longer good enough to believe that we become smarter and better looking the day we take a job with an organization that has money to give away. Not if we really want to work on the wicked problems that are so thorny. Here is just a sampling of the great ideas that came out of those conversations. Not many people know more about the problems you’re working on than the organizations active in the movement. No one has the whole picture, but the people doing the work are going to be the ones up on latest developments, who’s doing great things, and who’s just along for the ride. Bringing these folks into the grantmaking process can strengthen the whole thing. There are lots of ways to do this – as board members, decision makers on grantmaking, strategic planners, creators of theories of change – anything that brings their perspective into what needs to be done. It is important to deal with the power imbalance in grantmaking by creating systems and procedures that force us to open up the system, beyond just being nice about it. But aren’t they just going to push their self-interest, you say? Probably yes – and that’s just what you want. Movement leaders are going to push their perspectives about what needs to be done, and try to direct resources to the people they see as most effective. In the social sector the most important asset people have is their reputation, and few will want to torpedo their ability to work in the field by playing fast and loose with something as important as money for the movement. This creates a confluence of interest, not a conflict of interest. And as a grantmaker it’s still your job to digest the variety of opinions and perspectives that come in – just do it with the best informed people in the field in an open way, rather than with a disconnected board behind closed doors. When you talk to movement leaders, fundraising is often the most maddening part of the job. The people who run organizations know how to do many things and how to solve many problems, but when funders are aloof, don’t communicate, and make random turns and decisions, that is beyond the control of movement leaders. So become part of the movement, instead of walling yourself off. Make decisions with these leaders, whether it’s a change in strategy, a change in procedures, or choosing new board members. After all, if grantees succeed, you want that to be your success too. And if they fail, you need to see that as your failure too, and learn together from it. Being a funder means everyone wants a piece of you. The phone calls and emails can be incessant, everyone wants to talk to you at conferences, and you can never tell what to believe from what you hear. Unfortunately, many of us react to that by hiding behind opaque procedures, making our organizations mysterious. This raises the costs for the whole movement through time wasted by grantees looking for funding in unlikely places, and donors fending off potential grantees who really don’t fall into your set criteria. So return phone calls. Answer emails. Answer honestly when people talk to you. These are parts of the costs of doing business of grantmaking. While these conversations can be hard, at the end they are in the best interests of the movement you are supporting. And stronger movements are what we’re after, right? Are you that grantmaker that has a reputation for not playing well with others? For being hard to figure out? Like when you have bad breath, no one is ever going tell you that. So grantmakers need to make use of the outside groups that can confidentially ask your grantees – and non-grantees, hopefully – what you’re doing right, and what needs to be fixed. The Grantee Experience and Insight Review and the Grantee Perception Report are the two best known. Do the confidential surveys, learn from them, and adjust accordingly. We all recognize the power dynamics that come with having money vs. asking for it. But how to deal with the power imbalance? Above I talked about having concrete systems and procedures that balance things out a bit. But we can go beyond that, and help our organizations understand how privilege works. There are great training programs for leaders and grantmakers that can go deep into these areas, so we understand the importance of opening up a very closed and elite system. Bringing grantmakers into the movements we support is key to solving difficult problems. There is lots of experience in doing this – the Global Greengrants Fund and the Needmor Fund in the United States, Mama Cash in the Netherlands, Fundación Acción Solidaria in Mexico, and many others have shown that it is both possible and worth it to open up grantmaking beyond a privileged elite. And necessary, if we really want to make a difference. I’ve just returned from the National Adaptation Forum in St. Louis, which brings together people from across the United States to share practices on how we can adapt to climate change. The big development this year? 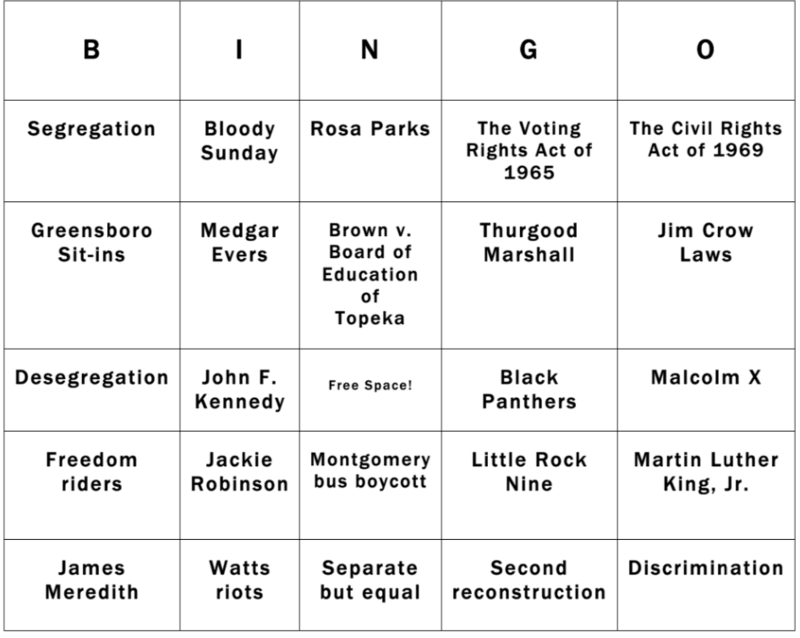 Greatly expanded inclusion of poor and minority communities. Like all grassroots groups, these groups didn’t limit themselves to the narrow world of climate, but linked adaptation seamlessly to issues of environmental justice, social justice, and just plain fairness. So while most of the discussion was among government officials, consulting firms and academics about how to do vulnerability analysis and build resilience, we also heard from community leaders in St. Louis, like Romona Taylor Williams from the Metro St. Louis Coalition for Inclusion and Equity (M-SLICE). She told us that working for environmental justice in her home town is part of working to be included in local politics in general. Turns out it’s not just about Ferguson. And there were lots of other grassroots groups – from Oakland, San Francisco, Gulfport, Longview, Prichard – who are now part of the national dialogue about what we do about these big changes that are already happening. These groups brought in the idea that it’s not good enough to have good analytical techniques and better engineering. A movement of people working for better adaptation will be more powerful than the best engineering. And linking them all together is what it will take. The key to building resilience is to understand the systems that people depend on, and to figure out what they are vulnerable to. But seeing systems takes practice. This piece looks at a simple example of seeing core systems, and using those insights to reduce risk from hazards. This is a photo of a typical African informal settlement. These homes are here illegally, and as a result there are no city services – electricity, water, waste collection, etc. In thinking about how to reduce risk in this community, there should be no city services to take into account as capacities or vulnerabilities. Yet look at the picture. Nearly every house has electricity and water. Many have toilets and sewage. How can this be? Where government or property developers do not provide basic systems such as roads, power, and water, people often find ways to get those things. In this photo, there are many hoses running across the stream. These hoses have been installed by private entrepreneurs, who have illegally tapped into the city water system. Same with the electric lines. In fact many of those houses also have satellite dishes, and many in the community follow news and events from around the world on television. Walking through the settlement also revealed that entrepreneurs have set up private facilities that provide showers and toilets for a small fee. These are emergent systems – that is, they emerge by the interaction of people with their circumstances, not planned by anyone. Even where official systems don’t exist, people use their genius and energy to find a way. In complex adaptive systems, look for self-organizing systems – those things that come together without oversight or direction from anyone. In fact the entire community should not be here, since this land is not zoned for residence or business. Yet the lack of suitable housing elsewhere in the city means that residents have few choices of other places to live, and government has few alternatives other than to look the other way. 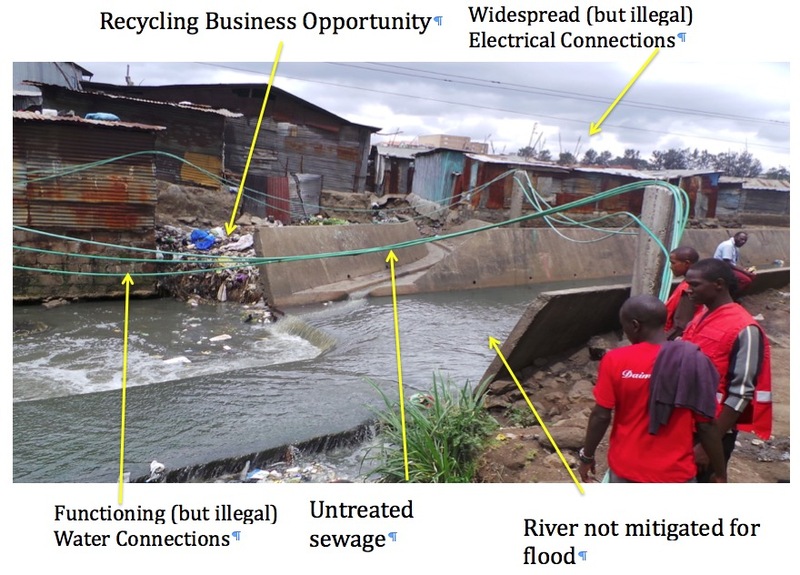 How can seeing systems help the community reduce risk? Hazard: Fire — Discussions with residents of this African community, local authorities and emergency personnel showed that one of the biggest hazards in this community was fire from these illegal connections. As a result, the community arranged for an outside technician from the electric company to come in and train local entrepreneurs in how to do safer electrical connections. The local authority agreed to host the trainings, and to levy fines on anyone who continued to use unsafe connections. Hazard: Diarrheal disease from dirty water – While awareness of the need for good sanitation and clean drinking water is high, residents simply have few options. Private baths and toilets have sprung up in the community, charging a small fee. Residents now have flexible options, and the business is sustainable. Note: an outside donor recently funded a competing bath and toilet facility, which is charging less than the private businesses. This strikes me as unfair competition. Worse, it undermines local initiative and a long term sustainable solution. 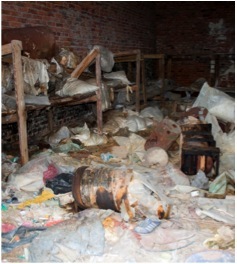 Hazard and Capacity: Solid Waste – Lack of trash collection turns parts of the settlement into a waste dump, with complications for people’s health and the attractiveness of the neighborhood. Low income inhibits many people from improving their situations. Much of the waste visible in the picture can be recycled, and there is a nascent recycling industry in the city. This is an example of how individual entrepreneurs can take advantage of a hazard and turn it into improved capacity through greater income. Pollution in it is a health hazard. Dealing with the pollution hazard means getting the industries upstream to stop dumping industrial waste into it. There are excellent laws in place for that, which are not enforced. So the community would need to form alliances with outside groups with better access to public officials, media, courts, etc. That problem probably cannot be solved by local action alone. But outside action is unlikely to take place without good organization and pressure from community groups. Action at all levels is necessary. Its location right next to houses poses a flood hazard. There are two solutions here. First, move the houses farther from the river. Legal restrictions have not functioned well in this area, so simply enforcing building codes is not an option (since the whole community would disappear in that case). Alternatively, there is an ebb and flow of houses closer to and farther away from the river every time it floods. At a point when people voluntarily move away after a flood, the community can organize to keep those houses farther away, and prevent them from creeping back. Put in mitigation measures in that newly opened up space to keep the houses from moving back in to the river banks. Residents can plant trees along the banks to absorb energy from floods and discourage building back close to the river. They can install simple biological pilings made of bamboo or similar material, and plant deep rooted grasses to protect banks not protected by cement. They can place rocks along the banks and across the river at intervals, again to slow down rushing water when floods occur. Some of these solutions individuals can do on their own. But many require community organization. Slum communities are often transient, with people moving in and out all the time as their fortunes change. Surveys in this community showed a fair amount of stability. So while you can’t see it with your eyes in the picture, it was possible to organize people in this community and begin to deal with issues collectively. Of all the interventions possible, organizing people for action in their own interests is often the biggest contributor to building resilience. I’ve always had a queasy feeling about how to plan programs for social change. We know we’re supposed to analyze the problem, develop a goal, objectives, activities, indicators and resources. It all makes sense from a logical point of view. But, but…How often does social change happen logically? How often have you seen a plan like this really pan out from start to finish? And if you’ve developed a whole logical framework around it, bringing in all the stakeholders to make sure everyone buys into it, it’s really hard to make adjustments as you go. You may see what’s actually happening but it can be hard to bring everyone along with you. This kind of planning seems to misunderstand how social change really happens. We treat society as if it were a tool, a tinker toy, and we just need to get the steps in the instructions for assembly right and we’ll get the change we want. But societies are complex adaptive systems, with all that applies. Maybe you’ve seen the online video about the guy at the outdoor music festival who singlehandedly gets the whole crowd dancing with him. If not, check out the “Leadership Lessons from the Dancing Guy” by Derek Sievers. It’s a lesson in how to build a movement in under three seconds. Watching that video reminds that social change is messy and unpredictable, and so our plans must match that adaptability and flexibility. The lesson here is that self-organizing groups can do remarkable things. And what they do and how they get together is very hard to predict. And that it rarely depends on a single leader – knowing how to follow is important too. A friend recently told me about an unexpected outcome during a program promoting potato production and marketing he was visiting in Latin America. Staff of the program were upset because they hadn’t met the outputs listed in the log frame – too few potatoes produced, too few farmers engaged. But further inquiry revealed that farmers had in fact been successful in getting the municipal government to put on a regional potato fair, had begun transporting potatoes to an urban market on the coast, and were even selling to a firm that was processing potatoes into organic chips for the European export market. But the partner hadn’t thought to report on these because they weren’t strictly part of the output metric on local marketing! OK, that’s a bit obvious, that’s just being enslaved to the log frame, and most people know that the log frame is just a plan to be adapted as you go. But they’re hard to adapt, especially if lots of groups and organizations are involved. And for social change on any decent scale to be sustainable, lots of organizations have to be involved. So rather than trying to strangle social reality into better and better log frames, let’s take this concept of complex adaptive systems seriously. I like the analogy of simple, complicated and complex that is often citied from the work of Frances Westley and her colleagues to understand what complexity means. To take other examples, designing a form for tracking staff leave is simple. Organizing an international conference is complicated. 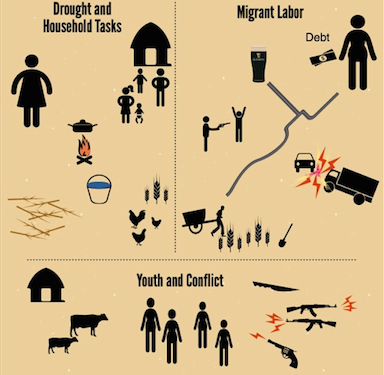 Reducing disaster risk from poverty and poor housing is complex. This means that we need to have programs that are complex too, and we need to adapt our planning and management accordingly. Note that this doesn’t mean all decisions. We need balance. A balance of predictability and oversight with decentralization and freedom. While each organization has to find that balance, generally administrative decisions need predictability and constancy, and program decisions need to adapt with circumstances to try out new approaches. In other words, don’t make people guess how much they should budget for per diem or how much leave they have, but do give them the freedom to engage with partners and communities in new ways to try out new approaches. Management by values – appropriate for networks and loose organizations where styles and objectives may vary, but all are working to the same goals in the same general way. For working on complex problems, agreement about core values can leave people considerable room to figure out how to get there. What is it that we envision as a sound solution to this problem, and what values are essential to the way we work? But why work in these loose, hard to manage ways anyway? With complex social problems, it is important to work in networks, and bring in interests and talents from a variety of places. This kind of management requires constant check-ins and communication. People thinking this way are still developing the tools for managing this way of working. The next part of this blog will dig into those a bit deeper. In the meantime, Heather Britt’s paper on Complexity-Aware Monitoring is a great place to start. As funders we often talk about supporting movements – the environmental movement, women’s movement, etc. Yet how do we do that? What does it mean to support a movement with grants? That’s Rosa Parks, and her story is famous. Tired after work one day, she was finally fed up and refused to go to the back of the bus. 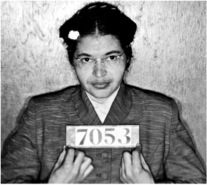 She wound up getting arrested, and as the churches rallied around her, the Montgomery bus boycott got started and achieved an early and important victory for the civil rights movement. Great story, inspiring. The only problem with it is that it’s not true. In fact Rosa Parks was Secretary of the Montgomery NAACP chapter, and had just returned from a few weeks training at the Highlander Folk School in Tennessee, famous for its training of community organizers. While her choice not to move that day was spontaneous, it was supported by her training, and by a group named the Montgomery Improvement Association, composed of local activists and ministers, which saw an opportunity and organized the boycott. Other people had been arrested for the same offense, but no organized action developed to support them. She was chosen as an upstanding citizen with an unblemished record, and much of the boycott had been discussed in advance. That is – there was a whole movement behind this one individual. The story of the individual who stands up and says no more is inspiring to us, but it rarely achieves much with a whole set of organizations, plans, campaigns, and leadership behind it. Which is precisely the problem with figuring out how to support a movement with grants. Movements are by definition messy, with many different community groups, non-profit organizations, academics, government officials, media, etc. all acting at times together, at times at cross purposes, at times against each other. The following chart gives a quick sense of how confusing the whole movement was at the time. Reverend Martin Luther King, Jr. was the face of many practicing civil disobedience, while the Black Panthers were willing to use violence as a tool. President Kennedy told activists he was sympathetic, they just needed to move more slowly so as not to alienate moderates. Others pursued legal strategies, and the Supreme Court came to be a major player. The list goes on. Who to fund? It helps a lot to have a simple conceptual framework of what successful movements do. It doesn’t mean you don’t have to do your homework and figure out who’s who, who’s with you and against you, and what the right timing is. But a conceptual framework will provide you with a mental structure to hang all these confusing elements on. Here’s one that has worked very well for me. Let’s break these down a bit to see what they mean. These are the resources, people and connections that do the work, that bring in new people, that develop contacts with media, government officials, for-profit companies, etc. Sometimes these are community based organizations, sometimes new forms of sustainable business, sometimes connections and networks. 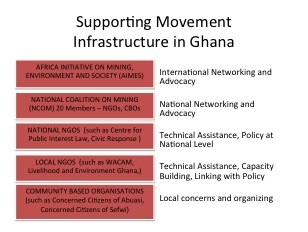 A great example is the National Coalition on Mining in Ghana. Over about ten years, a diverse collection of community based organizations, local, national and international NGOs, and national and international networks developed to promote the interests of local communities affected by mining. This coalition also promoted the public interest at national level by ensuring the mining revenue benefited the nation as a whole. The basic structure of the movement is illustrated here. Creating this infrastructure took hundreds of people and dozens of organizations. Multiple donors made over 40 grants to a variety of types of organizations for across the spectrum of possible strategies over a decade. The result is that after a decade, both government departments and mining companies realized that is was in the interests of everyone to bring any new policy or project ideas to the Coalition itself as a legitimate stakeholder. Movements shift the discussion around their issues to get people to look at them in a new way. They challenge the prevailing way that these issues are discussed. On justice in climate change, the movement successfully challenged the image that all countries need to curb emissions, pointing out that the industrialized world created the problem and benefited from it, while poorer countries now suffer many of the consequences. The feminist movement challenged the idea that gender roles are fixed and right, substituting the idea that each person has the human right to pursue opportunities in any sphere. networkingwith similar groups across the country. Over many years, the Movement of Dam Affected People in Brazil has successfully altered the debate in Brazil now to see that this is not a debate just about energy, but also about human rights, and treating people right so they do not become the losers in development. Funders can support this agenda shifting by making grants for alternative technical analysis of issues, alternative media production and distribution, or supporting sustainable businesses that operate in a less destructive manner. Successful movements both create and take advantage of opportunities as they present themselves. Often these opportunities come up suddenly, from some unplanned event. If movements have set up their organizational infrastructure, and figured out how to make a case for shifting the debate, then everything is in place to act when opportunities arise. An excellent example of this comes from Armenia. Armenian Women For Health And Healthy Environment (AWHHE) conducted educational events on proper handling of pesticides for many years. They produced educational and training materials. They established contacts with government officials in the Ministries of Agriculture and Public Health. They joined an international network, the Pesticide Action Network, which provided them with many resources – people, technical studies, experience of other organizations, access to United Nations meetings on chemical safety. Yet progress was slow. The one night fire struck a warehouse storing pesticides in the capital, spreading toxic fumes over the city. Using the opportunity, the group was able to use those contacts, educational material, and deep understanding of the issues to get the government to finally enforce the laws that are in place to regulate pesticides and protect public health. So this is a simple framework to help thing about who’s who and what needs to happen to make a movement a success. There are many details in all of this to get into – how to develop leadership? What kind of funds are helpful, and what undermines movement autonomy? Do we all have to be on message, or can we reframe our messages for different audiences? That’s where the genius of activists and their allied funders can be creative and take off. It will not always be clear what to do, in fact it rarely will be. But if we see ourselves as movement funders, then we also behave as movement members, and struggle with partners to make our visions a reality.